We all know that the better the roots the better the plant. Well look at this pot. This will give you heavy roots for your tomatoes , pumpkins, and any other plant you want great roots on. CHECK THIS OUT !!! Pot is 4 inches tall and 3 inches at top. Great size pot ! The Accelerator® air root pruning system is a natural way to help grow a better tree with a stronger root structure from propagation to final planting in the ground. Utilizing a patented root enhancement technology, Accelerator® containers produce much larger trees in the same time as conventional container products, at a cost-per-tree that is less than traditional methods. Not just for trees, get outstanding air root pruning results for all types of plants. The unique design of the Accelerator® container employs vertical corrugations to guide the root tips to air pruning slots located along the sidewall of the container. This results in a denser, more uniform root mass and eliminates root circling. Liner roots develop quicker and this can reduce the need for over-wintering protection. Plus, a healthier root structure means the shelf life can be extended without worrying about plant distress. Accelerator® prevents root circling and spiraling by utilizing a patented system of variable corrugations with air pruning slots. Trees grown in conventional containers can develop circling roots, and they will continue to circle when planted, ultimately resulting in the death of the tree. These containers cause rapid development of dense, lateral feeder roots, just like in nature, but more enhanced. Accelerator® produces greater rates of survivability when planted in native landscape. Your trees will flourish while field harvested trees are recovering from 75% of their roots being left in the ground. 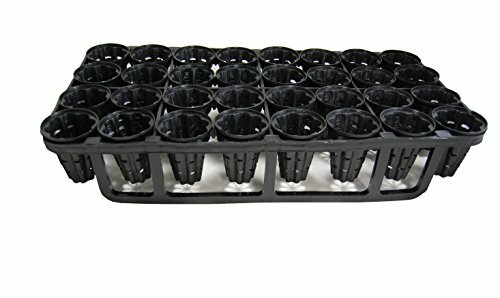 You are purchasing five trays and 160 air pruning pots. Promotes healthy lateral root growth. Easy to transport these pots in a heavy duty tray. Pots and Trays are Reusable!